It’s that time of year again. I need to top up my supply of “further reading” for my second year undergraduate course “Intro to Children’s Literature”. To some extent I do this as I go along and meet new books throughout the year. Yet a visit to a bookshop gives a real sense of what’s available and what is deemed to be popular. We’re always on the lookout for the next classic. In children’s lit the boundary between the classic and the popular is a little less well defined as in adult literature. So, it’s good to see what people are buying and what the bookshop is risking. It’s particularly good to do this at an independent bookshop. That’s where true book lovers go. The Urmston book shop, of course also has an excellent little café, providing good tea and coffee and locally sourced cake. 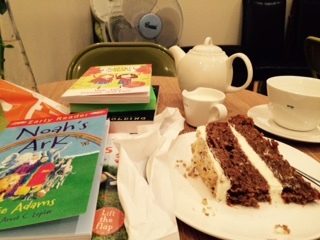 So, what better way to spend an afternoon: select a few books, then select a piece of cake and a pot of tea and settle down to start reading the books. I can really recommend the carrot cake. The café has changed since I was last there. It has moved into the events room so is a little bigger that the two tables set up in the corridor to the room. The cake display and kitchen is still there. There are still plenty of events and book clubs. Really worth a visit. I’m just looking for the next excuse. I’m very tempted by a couple of the events anyway.